Created from bartered wood, the striking burl patterns give the container and lid a very unique and luxurious appearance. 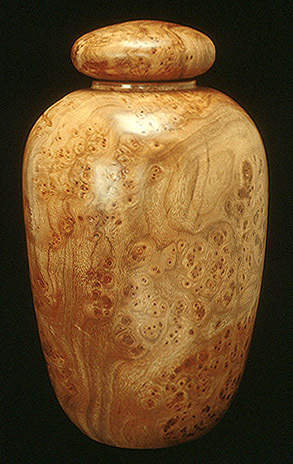 It is unusual to find a continuous "birds-eye" type of burl of this size. The tree from which this piece was turned grew on the banks of the Eastern Shore of the Chesapeake Bay for many years until it was blown down by a hurricane. The owner of the land was very grateful that the beauty of such a significant tree was memorialized as a keepsake. This jar could function as an urn, a coin bank, or as a container for other collectable items. The owner of this turning has it displayed amongst other works of fine art, both ancient and modern, most of which will be donated to the collection of the Carnegie Museum of Art in Pittsburgh, Pennsylvania. It is finished with multiple coats of Tung oil and carnauba wax buffing, which give the wood a very natural luster, and - if handled properly - will last a lifetime.